Molds for Injection Molding | Accurate Plastics & Mold Co. The injection molding process requires the use of an injection molding machine and a mold to produce the end product. In simple words an injection mold is an assembly of plates and other components which, if properly manufactured and assembled is capable of producing the required object from a given plastic material. 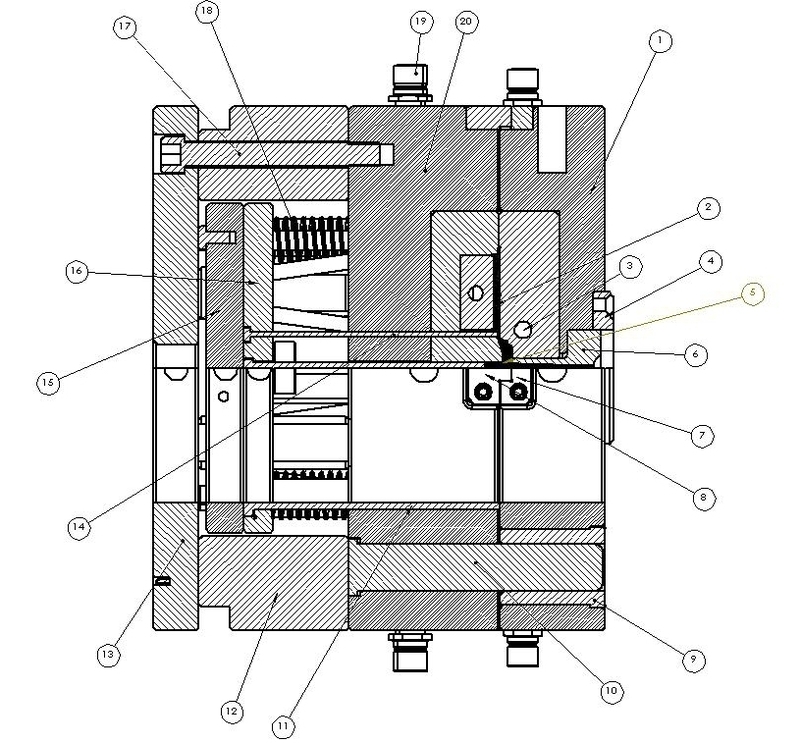 The figure below shows schematically what the typical parts of a mold might be, together with the terms used in the industry to identify the components of a mold. 15) Ejector retainer plate; 16) Ejector plate;17)Tie Bolts; 18) Return Springs; 19) Water Fittings; 20) Back Cavity Plate or " B side"
Most molds built in United States are made from a standard mold base. A typical mold base used as a reference in the industry is the one manufactured by D-M-E. Some shops might build their own bases. In any case molds have to follow certain requirements. The design of a mold must take into account the size of the press where it will be installed, proper cooling for an efficient cycle, method of part ejection from the mold,. Engineering plastics require the mold to be heated and mantained at specific temperatures. Provisions must be built to allow the clamping of the mold, and mechanisms for the ejection of the part must be included in the mold. A mold represents the main cost of the investment made for the production of an injection molded part. It is extremely important that the mold is designed and built by qualified toolmakers to the standards set by the industry. A properly manufactured mold will make the difference between profit and loss in a given injection molding project. Molds can be manufactured from different materials, the most common are specific grades of tool steel and aircraft grade aluminum. The choice of the material is determined by economical considerations such as tool life, production volumes and target cycle times. Other factors influencing the mold material choice are related to the properties of the plastic material used for the final product.Some plastics are more abrasive than others or can develop corrosive chemicals during the injection molding process requiring specialty steels such as hardened steels or stainless steels. At Accurate Plastics and Mold Co we have the experience and the equipment to manufacture the injection mold that will best fit your needs. We design our molds to meet your company's needs and our target of efficient cycle and long life tooling. Once the part design process is completed, we will be able to quote, design and manufacture the mold. The 2D manufacturing drawings should provide the dimensional and geometrical tolerances, surface finish and material grade of choice. The 3D drawing will allow us to estimate part weights, wall thickness, and determine the location of the parting line and if there are any undercuts that would require mechanisms to allow for part ejection. 3D drawings are also necessary for mold design and manufacturing. The estimated life of the product and order volumes will allow us to make suggestions for the type of mold material, mold surface treatments, number of cavities, type of gates, and part feeding systems. We can provide Mold Flow simulations when necessary to determine the configuration of the mold gating, cooling and other mold design specifications. The last step of mold making is mold sampling. Our in house injection molding department can quickly sample without delay your mold when completed and provide you with part samples for approval. All of our mold quotes include the cost of sampling. Our long relationship with select overseas manufacturers allow us to offer some other options besides domestic moldmaking and injection molding. Our partners in China can manufacture molds that are built to Accurate's standards so that they can be exported to USA for efficient production. We can also provide China grade tools, not for export. These tools are normally less expensive, can be ready in a shorter timeframe, and can be used for manufacturing of plastic parts in China only. No matter which option you choose, the tool design is supervised and approved by our engineers. If the tool is built in China no steel is cut until the design is approved by Accurate. After the tool is completed, it will be tested ( in our injection molding department if built in our shop, overseas if built in China) and first samples will be sent to the customer for approval. Short production runs to validate the tool or to provide pre production parts can be requested. We can also provide PPAP reports or first article inspections.